A battery is the soul of an electric-powered golf cart. Deep cycle batteries are used to power the engine to run the golf cart. Even though these types of batteries appear like conventional car batteries, deep cycle batteries are extensively used in variety of different applications where ordinary car batteries are not so suitable. While both are lead-acid batteries, deep cycle batteries supply a stable electric current for long hours, the car batteries release sudden bursts of huge amount of electricity to start the car engine and lasts only for a short time. Golf carts, like electric vehicles, draw the entire requirements of electric current from a set of batteries as one battery is not sufficient to drive a golf cart. Single golf cart batteries are normally available in 6- volts or 8-volts capacities. The pooled voltage from individual batteries in the pack is enough to get the desired voltage to power a golf cart. For example, a 36-volt golf cart usually consists of a set of six 6-volt batteries and a 48-volt golf cart is equipped with a pack of either eight 6 volt batteries or six 8-volt batteries. The power of the battery and its running time depends on the voltage. A higher voltage means a more powerful battery and longer running time However, the batteries should be charged regularly, otherwise, the total voltage of the battery pack has no relevance and batteries will be dead without charging. The total voltage of the battery pack of a golf cart determines the type of charger required for charging the batteries. For example, while a 36 V golf cart needs a 36 volt battery charger, a 48 Volt charger is required for a 48 V golf cart. If someone wants to upgrade his present 36V golf cart to a 48 V golf cart with the addition of two 6V batteries, he can either buy an extra 12V charger for the two new batteries or replace an existing 36 V charger with a 48V charger. As a general principle, the voltage of the battery charger should match the total voltage of the batteries. In order to ensure that golf cart runs without any breakdown, the batteries should be charged after every use. Most of the recent models of chargers are fully automatic and monitor the electric current while charging so that there is no scope for overcharging. Those having an old model of golf cart charger that is not automatic can set a timer to shut off the charger once the battery pack of the golf cart is completely charged. As a general rule, one should charge the batteries for at least double the time the golf cart was used. Another important point a golf cart owner should keep in mind is to assess from time to time how efficiently the batteries are working. In order to ensure that the batteries are in first-rate condition, they should be properly maintained. It is important to be aware of certain essential maintenance procedures such as checking whether water levels of the batteries are proper and about various cleaning methods to ensure that the surface of the batteries are free from dirt and corrosion. It is advisable to implement weekly or monthly maintenance routines to check whether the batteries are in good condition and that the safety measures introduced are adequate. One weak battery in the battery pack is enough to run down all other batteries and therefore, battery checks should be carried out frequently. If someone wants to fir the golf cart with certain accessories, the same golf cart batteries are sufficient to use these accessories. There are various methods to connect the accessories and they vary according to specific conditions. The voltage of most of the battery-powered golf cart accessories are 12 volts. The fast and simple method to operate the accessories is to connect them up directly to the two 6 volts batteries of the battery pack. However, this may lead to disparity in the battery pack, particularly if there are large numbers of accessories that require very high wattage. At this stage, it is advisable to provide an exclusive supplementary battery only for operating the accessories or a converter to uniformly distribute the electric current from all the batteries to the accessories. When it is time to change the golf cart batteries, it is necessary to find out the best way to dispose of the batteries. There are many retail shops that recycle old batteries for resale. 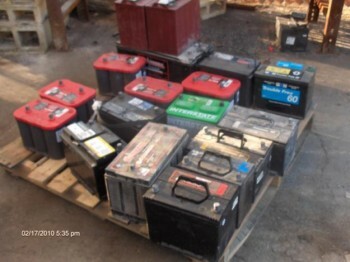 Most of the retailers that sell lead-acid batteries also accept used batteries as required by many state laws. It is good to recycle old batteries from the environment point of view as well as for the personal good health of the golfer and people around him. If you own an electric golf cart, one way of saving money is to recondition the old deep cycle batteries on your own. How do you do it? Click on the link below to visit the Electric Golf Cart Battery Guide and learn the reconditioning process. 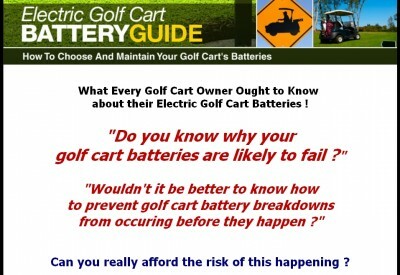 ==> Click here to visit Electric Golf Cart Battery Guide!